Croning moulding is carried out on heated standard plates and the thickness of the mould shell ranges from 5 to 15 mm according to how moulds are presented to casting. 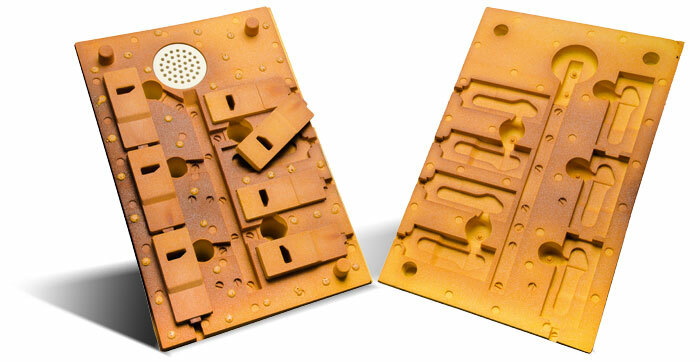 Moulds halves are put together when heated, after cores recasting when needed. Thin moulds are cast on an upward position, maintained in ad hoc tanks with sand, gravel or shot. Thick moulds are usually cast in a lying position on a sand bed. Another option would be to pull shells into a core box, ribbing them on the back, using press casting. The usual size of croning moulds is 400×300 à 600×400 mm, which makes it possible to cast parts up to 40 kgs. However, under specific circumstances and using this process, we can cast parts of more than 100kgs in 800mm² shells. We can carry out croning moulding using « core blocks » or fake shells (according to the required level of complexity). They would be recast in a usual worksite, with a few restrictions regarding gas releases and accuracy. Using this technique, you can have croning moulding quality without using shells, wether for large quantities, in Disamatic for example, or limited quantities for parts requiring high accuracy. You can also produce « external » cores, using all or part of a piece, in order to take advantage of croning moulding on a local basis, as these core walls can usually be recast with a sand or shell mould.